Hatch on Commutations. Dim. Sloppy. Unimpressive. ... we need to be very careful about letting convicted criminals out of jail early, particularly ones convicted of serious drug and firearm offenses ... When it comes to releasing offenders currently in prison [we] must be cautious. And that is why he has "taken a cautious approach to many of the criminal-justice reform efforts advanced recently in Congress" Indeed. More specifically, the Senator reminds us that "many incarcerees pled down from more serious crimes," so "the offense for which they’re serving time was not the offense initially charged, or the most serious offense for which the government could have won a conviction." It is an interesting point ... to a point. But, of course, incarcaerees should - generally speaking - only be serving time for what they have been convicted of, not what they could have possibly been convicted of. We sincerely hope Senator Hatch is not out to change all of that. Further, one would hope that competent federal prosecutors are not tossing out legitimate, serious charges flippantly, or for no reason at all. If they are, that would certainly be a reflection on them more than anything else. Finally, Hatch's superficial commentary fails to recognize that prosecutors pile charges on ("throw the book" at defendants), in part, to have chips to bargain away. If we are going to be very careful and all cautious and concerned, let's not toss basic notions of fairness and justice out of the window while we are posing. These are not 18-year-olds selling small amounts of marijuana to their friends in the locker room. These are hard-core drug traffickers. Many were caught with more than a kilogram of cocaine or heroin. We cannot afford to be letting hundreds of serious drug traffickers out early without assurance that they will not return to their criminal ways. One individual whose sentence President Obama recently commuted committed his first felony when he was only 16 years old and ran the largest cocaine ring in Topeka, Kansas. This is hardly the type of offender who should be a candidate for early release. How ironic that, while warning about the need for care and caution, Senator Hatch is so reckless in his analysis. He has a half-baked anecdote, sure, but nothing like serious empirical data to demonstrate that he is the only thinking person in the room. President Obama has commuted the sentences of hundreds of prisoners. But Hatch says nothing of their prison records / their conduct, their efforts at self-improvement, or the amount of time they served, or the recommendations of judges and prosecutors. He says nothing of changes in sentencing laws - supported by both parties, in both chambers of Congress - and the failure to apply the new laws retroactively. And God forbid that Hatch would say anything about the dynamics of human existence, change, or rehabilitation. No, that stuff doesn't exist in Hatch's world, or inform his analysis. Change is an "overly liberal" concept. Once hard-core, always hard-core. One suspects Hatch has not lifted a finger to examine the individual files of those who have received commutations of sentence in the Obama administration. His knowledge is as shallow as it is skewed. Why is President Obama making history with his use of the pardon power, and commutations of sentence in particular? 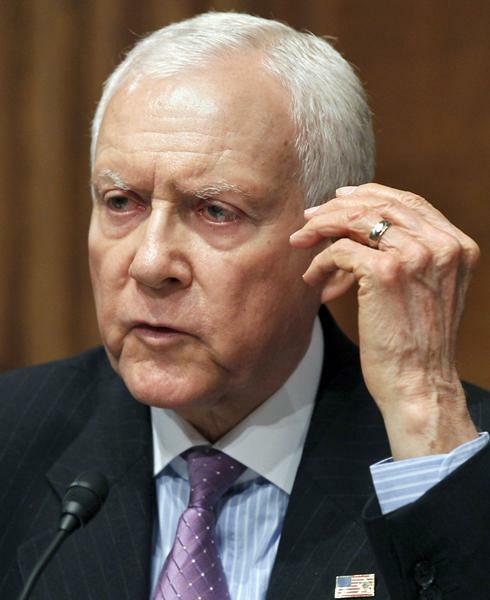 Because people like Orrin Hatch have had their say - and their way - for way too long. See Hatch's full editorial here.